More-or-less everybody should have a high level of thinking skills. It is very dangerous to live in a society where a few people have high-level thinking skills, and the rest don’t. Democracy does not work well in such a society. Also: People who have high-level thinking skills are generally more productive than people who don’t. As a consequence, jobs that require high-level thinking generally pay better than jobs that don’t. Almost everybody knows how to run, after a fashion. However, if you sign up for the track team, or the soccer team, or anything like that, the coach will train you to run better, possibly a lot better. Everybody knows how to think. It would be incorrect and insulting to tell someone they don’t know how to think. However, the fact remains that a good science class will train you to think better, possibly a lot better. Sometimes good thinking and good learning habits are taught implicitly, by osmosis ... but sometimes they are discussed explicitly, as a topic unto themselves. This topic is called metacognition, which means “thinking about thinking”. That is, thinking skills are by-and-large separate from domain knowledge. To solve real-world problems in a particular domain, you need knowledge about the domain plus general thinking skills. If you have high-level thinking skills, you can become proficient in a new domain just by learning the new domain-specific knowledge; you don’t need to learn the thinking skills all over again. For more about problem-solving in general, see reference 1. Einstein said “An education is what remains after you have forgotten everything you learned in school.” I’m pretty sure his point was that thinking skills remain, even after all the narrow domain-specific factoids have been forgotten (or have become irrelevant). Anecdote: Once upon a time, a friend and I were conducting sea trials in a large, brand-new sailboat. The two of us had worked together before, debugging large computer programs. As you can imagine, debugging a computer program requires a detailed understanding of the computer language ... whereas debugging a boat requires considerable knowledge about how boats work, which is quite a different body of knowledge. However, both of us were struck by the fact that we used essentially the same process in both cases. We checked the typical case, then we checked the edges of the envelope, then we checked the corners of the envelope. When we observed small anomalies, we made a note of them, and then did whatever was necessary to make them reproducible. And so forth. We both knew what had to be done, and we each knew what the other guy was thinking, which helped us to work quickly and efficiently. There are 40 questions to be answered in 30 minutes. There is time pressure; i.e. few students can answer all the questions in the allowed time. Each question is multiple choice. The questions are equally weighted. Only the final answer is scored, not the work leading up to the answer. It is distinctly unhelpful to place much weight on game-show tests. You can see at a glance that such tests have several built-in weaknesses. Such questions are atypical of real-world situations. Suppose you get an office job or a factory job. Do you really think people are going to walk up to you and ask multiple-choice questions that you can answer in 45 seconds? Don’t count on it! Most real-world questions require you to think for a lot longer than 45 seconds. It would be nice if the tests included a few questions that required actual thinking. However, alas, the format of the test does not permit this. This stems from the fact that the questions are equally weighted and there is time pressure. That means that if the test ever did have a question that required more than 45 seconds to answer, students would be well advised to skip that question and focus on the easier questions. Because of the time pressure, and because of the wide range of topics that might be touched on by the questions, the students are encouraged – and well-nigh required – to become a mile wide and an inch deep. See reference 3 for more on this. Because only the final answer is scored, there is no direct incentive for showing the work leading up to the answer, or for making the work checkable. This promotes bad habits. See section 5 for a discussion of this point. Under the terms of the ECLBE law (Every Child Left Behind Equally), testing is required, but the details have been implemented in a crazy way. The design of the tests has been delegated to the states. Each state has nothing to gain and everything to lose by having a test that actually measures anything. The entirely foreseeable result is that the test-vendors (who prepare the tests on behalf of the states) are engaged in a “race to the bottom”, preparing tests such that anyone can score well, whether they know anything or not. I find that game-show tests are not good for predicting anything I care about. I would never hire somebody based on a good test score, and I would never reject somebody based on a bad test score. I’ve known too many absolutely brilliant people who didn’t do well on game-show tests. I used to say that such tests don’t predict anything at all, but if things keep going the way they are, such tests will begin to predict success in school ... for the simple reason that success in school is being measured, more and more, by such tests. This is circular in a truly ghastly way. It encourages rote learning and discourages thinking. There is a natural tendency for teachers to teach to the test. That can be either a good thing or a bad thing, depending on how good the test is. We need better tests. We need much, much better tests. In particular, we need tests that measure thinking skills. On the plus side: Most kids enjoy thinking. Most kids enjoy riddles, if properly presented. They entertain each other by telling riddles. Any reasonable-sized bookstore will carry books of riddles – including physics riddles – even though they don’t carry textbooks. If you do it right, kids will increase their thinking skills and enjoy it. On the minus side: In many (but not all) textbooks, the end-of-chapter problems do not require thinking, and indeed train students not to think. Instead, the problems call for rote regurgitation of factoids presented in the chapter. After years of a steady diet of such problems, students will be alarmed and recalcitrant if you suddenly assign them homework that requires nontrivial thinking. You will have to explain that your course is different from other courses, past and present. Then you will have to patiently teach them the required thinking skills. Then you can assign problems that require thinking, with gradually increasing complexity. Some parts of critical-thinking task are hard, but some of them are easy. Indeed you should have learned some of them in third grade, such as item 3, item 4, and item 10 in the following list. Learn how to learn. Mull over each new idea, to see now it is connected to everything else you know. Make this a habit, a reflex. Do this in class. Do this all day every day. This is hugely important. A memory is not useful, and hardly even counts as a memory, if you cannot recall it when needed. Thinking about the connections increases the usefulness of each memory, by increasing the number of ways in which it can be recalled. See section 10.1 and reference 4. Don’t expect to master an idea the first time you see it. Use the spiral approach, as discussed in reference 5. That is, learn a few rough ideas, then spiral back again and again, connecting the ideas, refining the ideas, and gradually adding new ideas. Check your work. Any problem worth doing is worth doing in two different ways, as a check. Some additional discussion can be found in section 5. Some examples that benefit from (or utterly depend on) finding multiple solutions can be found in section 14. Don’t judge a book by its cover. Don’t judge a steak by its sizzle. Beware of misconceptions and ambiguities, as discussed in section 8.3. Build up good math skills. Continuing down that road: Dimensional analysis and scaling laws require algebra. See See reference 6 and reference 7. In physics, the equation of motion are easy to understand in terms of calculus and vectors. Thermodynamics requires a good grasp of probability and multi-variable calculus. Experimental design as well as data analysis require probability. With the math, you can learn a relatively small number of powerful, versatile principles. You can understand where the rules come from and how they fit together. Without the math, you are reduced to learning a huge number of unprincipled inflexible rules that apply in special situations. These rules have to be learned by rote, because there is no way to see where they come from or how they fit together. The principles are easy to remember, because they get used again and again. Every time a memory is used, it gets stronger. Special situations arise so rarely that by the time the situation arises, you are likely to have forgotten the special-purpose rule. Become proficient at estimation and qualitative reasoning. This includes expanding things to lowest order, scaling, dimensions, units, et cetera. See reference 6 and reference 7. Be on the lookout for conservation laws and symmetry principles. Draw the diagram. If it’s electronics, draw the circuit diagram. If it’s relativity, draw the spacetime diagram. Don’t try to solve the problem in your head if you don’t have to. Beginners often try to get away without drawing the diagram ... even in situations where experts would immediately draw the diagram. Be methodical. Don’t hurry so much that you make dumb mistakes. There is no advantage to getting the wrong answer quickly. Neatness helps. See reference 8 for more on this. Paper is cheap. If you need more paper, get more paper. Again, see reference 8 for more on this. If you’re playing a game, know the rules of the game. If you’re taking a test, know the rules of the test. See reference 9. When possible, be scientific. Some more-advanced principles and methods for doing science are discussed in reference 10. Thinking clearly about cause-and-effect relationships is particularly important ... and all too often, this is very badly taught. This cuts right to the core of what science is. As Galileo and others have pointed out, physics must describe what happens, and it may or may not explain how it happens, but the fundamental laws almost never say why it happens. This is discussed in detail in reference 11. You should apply critical thinking skills to all of your thinking, all day every day. Critical thinking is not some sort of add-on. It is not something you save for special occasions. It has to be baked in, like the oatmeal in oatmeal cookies. You can’t bake the cookies without oatmeal, and then sprinkle oatmeal on them afterwards. See also section 16. Sometimes the indirect approach is more convenient than the direct approach. Also, as discussed in section 5.2, a devious solution can serve as a valuable cross-check on the straightforward solution. a) Add 198 plus 215. You can easily do this in your head if you rearrange it as (215 + (200 − 2)) which is 415 − 2 which is 413. The small point here is that by rearranging things, a lot of carrying can be avoided. b) Decide which is larger: 12345/12347 or 23457/23459. You can easily do this in your head if you rearrange it as (1 - 2/12347) versus (1 - 2/23459). Both are less than 1. The latter is clearly closer to 1. The small point here is that by rearranging things, and by using quanitative facts about arithmetic, such as the idea that inverse is a monotonic function, long division can be avoided. Note: You could perhaps consider a shorter problem, perhaps 5/7 versus 7/9. On the other hand, the longer version makes it clear that this is meant to be a logic puzzle, not a simple division problem. It increases the value of the clever approach over the brute-force approach. The indirect, understanding-based approach is equally easy for both versions. So it’s not clear that the shorter version is doing anybody a favor. c) In your head, without a calculator or even pencil and paper, decide which is larger: 25/28 or 15/17. This looks simpler than the previous question, because the numbers are smaller, but it is more challenging, because the two sides are more nearly equal. We know the value of a and b, so we don’t need to solve for them, but for now let’s leave them as symbolic rather than numeric. Observe that this now has the same structure as the previous example (item b), and the previous reasoning can be reused. I can do all of this in my head, in less time than it takes to find a pencil and paper. There is more than one method of solution. Just because you’ve been taught a cut-and-dried, straightforward algorithm doesn’t mean you are required to use it. The devious method of solution might be easier. The method that is easiest on paper may be different from the method that is easiest when you’re doing the problem in your head. And that in turn may be different from the method that’s easiest when you’re using a computer. Even more importantly, no matter which tools you are using, it pays to find more than one method of solution, because each serves as a check on the others. If you were programming a computer to do arithmetic, it would probably be easiest just to use a cut-and-dried method. It’s routine, and it’s the same procedure every time. In contrast, people are not as good as computers at performing routine tasks reliably ... but they are better at using imagination. The cut-and-dried algorithm for long addition or long division can be carried out by a person who doesn’t understand what the algorithm means or where it comes from. That is, it can be performed by mechanical operations on the numerals, without understanding that the numerals represent numbers. In contrast, the devious method requires making use of the axioms of arithmetic (associativity, commutativity, et cetera). This shows that the axioms are not airy-fairy abstractions, but are helpful in practical situations. In other words, it pays to understand the principles, not just memorize the procedures. All these points can be made at the elementary grade level, and then reinforced in every grade thereafter. Innumerable examples of this sort can be integrated into the curriculum, on an every-day basis. Asking for imaginative solutions to the problem should be the norm, not the exception, as soon as the requisite groundwork has been laid. Example (c) illustrates the somewhat-counterintuitive point that sometimes it is easier to do the general case rather than the specific case. It’s just plain easier, even if only one specific case is of interest. The advantage is even greater if there are multiple specific cases on the agenda. The advantage is even greater if the generalization provides some insight into the structure of the problem, into the nature of the problem. There is artistry involved in finding a “good” generalization. Equation 2 is not the only possible generalization of equation 1. The artistry is not however a shot in the dark. Experience suggests patterns that are worth looking at. In this case there is an analogy to differential-mode signaling. On the LHS of equation 2, (a) is the common-mode signal, common to both numerator and denominator, while (3) is the differential-mode signal. Rewriting it so as to focus attention on what’s common and what’s different is a technique that you can use in lots of situations. Example (b) is more challenging that example (a). Both call for an indirect approach, but (b) requires stringing together a somewhat longer chain of ideas. Indirect reasoning and multi-step reasoning are both important skills, but they are not entirely the same skill. On the other hand, example (a) and example (b) are not entirely different. They both involve replacing one or two difficult steps by a larger number of easy steps. I tell students: You’re not Superman, and I’m not Superman either. I’m not going to teach you how to leap tall buildings in a single bound. Instead I will show you where the stairwell is. We can get to the top one step at a time. Very often when the task seems impossibly hard, you can break it down into a number of easy steps. Terminology: Sometimes the term “compensation” is applied to situations like this, i.e. transforming a problem in some non-automatic way in order to make it easier to solve. I don’t particularly like that term, because it is educationalese jargon, in contrast to the more natural, expressive, and descriptive terms that are available. I prefer to speak in terms of multiple, imaginative, devious, indirect, and/or outside-the-box approaches to the problem. As I see it, question 4 is plain old arithmetic, not algebra ... whereas question 5 is algebra. It’s just barely algebra, but it’s definitely on the algebra side of the border. The point is that equation 5 can be solved using subtraction, but it doesn’t explicitly tell you that; no minus signs appear in the equation. You have to apply a little bit of reasoning before it becomes a routine subtraction problem. For the arithmetical examples at the beginning of this section, the straightforward arithmetical approach would have worked; it just would have been less convenient. This stands in contrast to equation 5 where some modicum of reasoning is required. It stands in even greater contrast to the nine dots puzzle (section 14.2), where the straightforward approach simply doesn’t work, and the solution requires imagination – not just reasoning, but imagination and creativity. It’s important to make the work checkable. Some day you will be doing something important, where a mistake could cost millions of dollars and/or put people’s lives at risk. Important work obviously needs to be checked. Therefore you should get in the habit of making your work easy to check. Even if you are doing exercises that aren’t really important, pretend they are important, and check the work. To put it bluntly, if you cannot be trusted to check your work and to make it easily checkable by others, you won’t get hired to do anything important. The first step toward making the work checkable is to show your work. Also, to the extent that you have checked your own work, show the checks. The same principle applies to software: Document your code. For more on this, see reference 12. This applies not only to calculations on paper, but also to computer programs including spreadsheets. If one cell in the spreadsheet contains a number, use the neighboring cells to document what the number means. There is a double rationale for labeling the numbers: It is partly so that you can go back and check your work ... and partly so that other folks can check your work. Also note that the architecture of a multiple-guess test rewards taking a slap-dash approach to every problem. IMHO we urgently need better tests, and a better educational system in general, something with better rewards for meticulous work. That includes choosing a modest number of important problems, rather than a huge number of trivial problems. Suggestion to teachers: One small step in the right direction is to arrange the scoring scheme on every quiz so that getting the numerically-correct answer is nowhere near sufficient for getting full credit. Another part of the score is for showing the work leading up to the answer, and yet another part is for double-checking the answer and showing that work as well. Also: Sometimes it helps to assign the same question twice, perhaps as two items on the same assignment, or perhaps on two separate assignments a week apart. The point is to find a second, independent method of solution. Anybody who used method A the first time should use method B or C the second time. Anybody who used method B the first time should use method A or C the second time. And so forth. It must be emphasized that we are not redoing the problem because the first solution was wrong. The point is that there are multiple perfectly correct solutions, and we want to find them. There are many, many ways that a solution can be verified. More generally, check the scaling. Remember that dimensional analysis is just an elementary approximate form of scaling analysis. For example, if the capacitance is C = є0 L W / g and you mistakenly write C = є0 L g / W instead, the dimensions will be OK but the scaling will be wrong. The capacitance should scale directly with the width W and scale inversely with the gap g. For more about scaling laws, see reference 7. |a| had better be less than |c| (or equal in degenerate cases). |b| had better be less than |c| (or equal in degenerate cases). |a| + |b| had better be greater than |c| (or equal in degenerate cases). a2 + b2 had better be equal to c2. For each step in a calculation, you can oftentimes verify the work by working backwards. For example, if the step involved calculating X minus Y to find Z, you should verify that Z plus Y equals X. In other words, you can use addition as a check on your subtraction. There are almost always numerous constraints that must be satisfied at each step along the way. The details will vary from problem to problem, so it is your job to figure out what constraints apply to the problem and hand, and then verify that each step satisfies the constraints. If there are multiple elements in the solution-set, be sure to check each of them. The Mississippi Flow problem (section 14.4) can be solved in two independent ways, both of which are roughly equally convenient and equally accurate. Devious methods, as discussed in section 4, are sometimes merely a convenience, but are sometimes tremendously valuable as a cross-check on other methods. Suppose you want to find the velocity necessary to keep an object in orbit. You could analyze the problem once in the ECNR (earth-centered non-rotating) frame, and then analyze it again in the rotating frame. The same idea applies if you want to find the force experienced by the rider in a centrifuge, or practically any other situation involving rotational motion. Analyze it once in the lab frame and then analyze it again in the rotating frame. Verifying the solution is valuable, but beware that it does not protect you from all possible errors. For example, if you have overlooked some elements of the solution-set, verifying whatever solutions you have found won’t alert you to the existence of other solutions. As another example, in the trigonometric example given above, if you inadvertently reverse the roles of a and b, you will get the wrong answer, but it will still satisfy the four trigonometric constraints itemized above. Loosely speaking, any problem that requires thinking is called a puzzle or (equivalently) a riddle. Also, most puzzles have the further property that it is much harder to find a solution than it is to verify and understand a solution once it has been found. For example, consider the “eleven words in one” puzzle (reference 13). A given solution can be verified directly ... but a direct attack to find the solution would be thousands of times harder, since it would require searching through all the six-letter words in the English language. Note: Easy verification is related to what computer scientists call the NP property. (If you don’t know what this means, don’t worry about it.) This is also related to what some puzzle aficionados call this the “Aha!” property, especially if the puzzle hinges on a single point that is obvious in retrospect. Puzzles can be classified along various axes, as we now discuss. Moving along the K axis we come to problems that are “almost” self-contained, in the sense that they depend on facts that are unstated but well-known and easy to bring to mind. Farther along this axis are problems that require some amount of domain-specific knowledge. Reference 19 is a well-known source of open-ended questions and puzzles that involve modest amounts of physics knowledge. The “Who Owns the Fish” problem (reference 20) is intricate enough to scare away most people, but it is near K=0, because it is completely self-contained and well-posed. The statement of the problem contains just the information required to solve the problem ... no less, and essentially no more. The “Mississippi Flow” problem (section 14.4) problem is very far from being self-contained. It requires you to rack your brain searching for information that might help solve the problem. A wide search is necessary, because seemingly very disparate tidbits of information turn out to be helpful. This is characteristic of a wide range of real-world problems. We can also define a B axis, which indicates to what extent a direct approach suffices, or not. The nine-dots puzzle (section 14.2) is the quintessential example and the source of the expression “outside-the-box thinking”. Other venerable examples where the direct approach fails include the dog-duck-grain problem and the orchard with 10 trees in five straight rows of four trees each. If an indirect approach is needed, you need to use your imagination to find it, as discussed in section 4. Small: In the “four hats” puzzle in reference 21, there are four main hypotheses that must be considered. Similarly, in the fox-duck-grain problem, there are only a handful of possibilities. Medium Large: The “Eight Queens” problem in pseudo-chess involves “only” 648 possibilities at most. In fact it is much easier than that, because there is a simple iterative greedy algorithm that works just fine. If you want more of a challenge, find all solutions to the Eight Queens problem. Large: In the “Who Owns the Fish” puzzle in reference 20, if you formulate the problem in the obvious way there are billions of hypotheses to be considered. Similarly, board games such as chess or go commonly involve huge numbers of possibilities. Even something as simple as “king+rook versus king” – if you go about it the wrong way – involves almost (22*8)50 possibilities, which is well over 10100. As large as those numbers are, they are still finite, so in principle one could enumerate all the possibilities by brute force. On the other hand, if you want the time you spend on it to be less than the age of the universe, you need to find an approach that is more efficient than brute force. Infinite: In the Bongard problems (section 14.8) where there are no a priori limits on what hypotheses should be considered. The number of hypotheses is, for practical purposes, infinite. There are two constraints on the infinite set of hypotheses: Firstly, obviously, most of the hypotheses must have infinitesimal a priori probability, so that the overall probability remains normalized. Secondly, the distribution needs to converge sufficiently rapily that its entropy remains finite; otherwise it would be impossible in principle to solve the problem. Similarly, the Mississippi flow problem (section 14.4) is in some sense infinite or nearly so ... not so much because there are infinitely many answers, but because there are nearly infinitely many dusty corners of your mind where you must look for potentially-useful information. It is also worth noting that some puzzles (and many real-world problems) have multiple solutions; that is, there are multiple members of the solution set. As an elementary example, suppose the desired answer is x and we know that x2 = 81. If you find an x-value that solves the equation, you may or may not have found the desired answer. A much more challenging example is to find the complete solution-set to the “south/east/north triangle problem” (section 14.6). Many people find one solution and express absolute certainty that it is the only solution. It’s not. For some reason that I don’t fully understand, finding one solution creates a tremendous psychological barrier to finding another solution. Perhaps this is just a result of poor training: the students have been trained to expect that every homework problem will have only one solution. b) What are the methods? Question (a) has essentially only one answer, but question (b) has a solution-set with at least two members. Again it seems that finding one answer to question (b) creates a tremendous psychological barrier to finding another answer. It must be emphasized that being able to solve question (a) in two different ways is a tremendously valuable skill, because it vastly decreases the chance of making an undetected error. We now consider problems that are underspecified, overspecified, or otherwise ill-posed. The most troublesome kind of ill-posed problems involve inconsistencies. That is, sometimes the “facts” you’re working with are not entirely true. To deal with such problems, you need to move beyond black-and-white notions of true-and-false; instead you need to weigh the probabilities. Similarly, you are no longer dealing with facts; instead you are weighing the evidence. Some of the inconsistencies are exogenous, i.e. they come from what other people have told you. Other inconsistencies are endogenous, i.e. they come from assumptions that you have made on your own. Some “recreational” puzzles, especially those that involve outside-the-box thinking, are useful for developing a subset of critical thinking skills, because they tempt you to make false assumptions, and force you to question your assumptions. On the other hand, the overwhelming majority of “recreational” puzzles are well-posed, which means they don’t really exercise the full range of critical thinking skills. For more discussion of ill-posed problems, see reference 22. We agree that the handle in question is meant to symbolize the landing gear. It is even shaped like a miniature landing gear, as shown in figure 1. However, the handle is just a symbol; the real landing gear is something dramatically different. Wanting the landing gear to be down is not sufficient. Putting the handle down is not sufficient. It is the pilot’s job to verify that the actual landing gear is down and locked. People are normally good at symbolism. It is one of the things that makes us human. 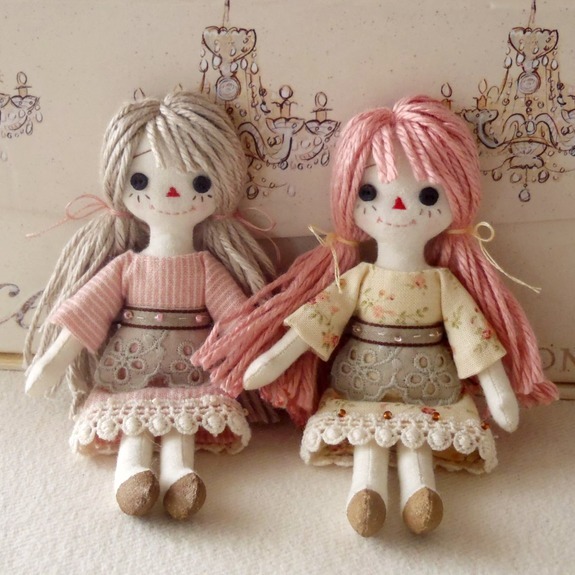 In figure 2, the dolls’ eyes are made of buttons, but we are not supposed to think of them as buttons. We are expected to look past the symbol and think in terms of the thing symbolized, namely eyes. In the same way, numerals are different from numbers. The numeral is a symbol that merely symbolizes the actual number. Any given number can be symbolized in many different ways, including seventeen, 17, xvii, 0x11, 17.0000, et cetera. The idea of symbolism has been pretty well understood for at least 2000 years; see reference 23 and reference 24. Proper symbolism should never be taken for granted. By way of counterexample, a pocket calculator does arithmetic without understanding what the numbers mean. It does not really deal with numbers at all; instead it unthinkingly manipulates the numerals according to cut-and-dried rules. Never confuse the symbol with the thing symbolized. Here’s another example: There is an abstract, ideal thing called a derivative. Like prisoners in Plato’s cave, we never get to see the real thing, but we do get to see various manifestations of it. For starters, we get to see symbols such as dy/dx. It is distressingly common for students to recognize dy/dx as a derivative, but not recognize dE/dS as a derivative. This suggests that they have not been watching the shadows closely enough, because on Tuesdays the derivative projects out as dy/dx, and on Wednesdays it projects out as dE/dS, et cetera. As always, the goal is to look beyond the shadows to understand the big picture. You need to wrap your head around the abstract, ideal, Platonic derivative. When you understand the derivative, you know that it projects out as all sorts of things of the form d(⋯)/d(⋯), acting on some variables. The idea of derivative transcends the choice of variables. The nice thing about math and physics is that we are much better off than those old Greek guys. We are better off because our cave has multiple walls, allowing us to look at multiple projections of the same ideal thing. For example: On one wall the derivative projects out as symbols of the form d(⋯)/d(⋯). Meanwhile, on another wall, it projects out as a diagram with a tangent vector that indicates the instantaneous slope. On yet another wall, dE projects out as the gradient vector (aka the exterior derivative), which we can diagram as a set of contours of constant E. Then dE = T dS can be considered a statement about proportionality between two vectors in some highly abstract space. In any case, your job is to look past all these representations to see the referent, to see the thing being represented. A closely-related issue is discussed in section 8.2. On Madison Avenue, there is a saying: “The sizzle sells the steak”. This is related to what we discussed in section 8.1, insofar as the sizzle is only a symbol that is meant to call attention to the steak. Logical thinking requires considering all four possibilities. In contrast, it is a common mistake to think that there are only two possibilities, namely B and C. Sometimes people get so disgusted by bad products with deceptive advertising that they make a knee-jerk transition to the diagonally-opposite policy, namely a good product with little or no advertising. This is a bonehead move. The correct move is diagonal, but rather horizontal, from B to A. You can perfectly well apply sizzle to a nice wholesome steak. More generally, the point is: Do not assume two variables are linked. Some variables are linked, but some are not. If they are linked, there may be tradeoffs; you may have to optimize one variable at the expense of the other. However, if they are unlinked, you may be able to optimize both of them simultaneously. Here is another example, applied to persuasion in general. Category B might be called empty rhetoric ... but keep in mind that not all rhetoric is empty. Here is yet another example, applied to politics. Category B might be called dirty politics ... but keep in mind that not all politics is dirty. You want to find a politician who has good policies and enough charisma and political strength to get people to go along with those policies. Very commonly, there are two or more concepts that are not clearly distinguished. This is a major obstacle to correct thinking. Often the ambiguity is reflected in the names we give things. That is to say, there are multiple different things represented by the same symbol. For example, in physics there are two different things that “gravity” might mean, and at least four different things that “heat” might mean. In math, there are at least three different things that “closed” might mean, and two different things that “primitive” might mean. And so on. Sometimes it is possible to figure out from context which meaning should apply, but this is laborious and error-prone. As a specific example, a well-known cryptography book quoted one definition of “primitive” in a context where the other definition was required. Additional examples of ambiguous and/or misleading terminology can be found in reference 25. Sometimes you can fix this problem by using different words, for example replacing the word “heat” with TdS, if that’s the intended meaning. Sometimes you can fix the problem by adding adjectives to the old words, for example talking about “massogenic gravity” versus “framative gravity”. By way of example, suppose you were asked to fit a sine wave to a set of measured points as shown in figure 3. The obvious solution to this problem is shown in figure 4. That looks like a good fit. The amplitude, frequency, and phase of the fitted function are determined to high precision, according to the standard formulas. Even so, some crucial questions remain: How sure are you that this is the right answer? How well does this fitted function predict the position of the next measured point? These are tricky questions, because an unrestricted search for the sine wave that best fits the points is almost certainly not the best way to predict the next point. Figure 5 is the key to understanding why this is so. It turns out that for almost any set of points, you can always find some sine wave that goes through the points, as closely as you please, if you make the frequency high enough. However, this can be considered an extreme example of overfitting and the over-fitted sine wave will be useless for predicting the next point. Another term that gets used in this connection is bias-variance tradeoff. These facts can be quantified and formalized using the Vapnik-Chernovenkis dimensionality and related ideas. A sine wave has an infinite VC dimensionality. The sine wave stands in contrast to a polynomial with N adjustable coefficients, for which the VC dimensionality is at most N. That means if you fit the polynomial to a large number of points, large compared to N, the coefficients will be well determined and the polynomial will be a good predictor. There are some deep ideas here, ideas of proof, disproof, predictive power, et cetera. For more on this, see the machine-learning literature, especially PAC learning. Reference 26 is a good place to start. This sine-wave example calls attention to the fact that the family of fitting functions we are using (sine waves with adjustable amplitude, frequency, and phase) has an infinite VC dimensionality, even though there are only three adjustable parameters. We see that three data points – or even a couple dozen data points – are nowhere near sufficient to pin down these three parameters. This tells us that VC dimensionality is the important concept, and “number of parameters” is only an approximate concept, sometimes valid but definitely not always. Another example of what can go wrong is shown in figure 6. The black curve represents the raw data. We have lots and lots of data points, with very high precision. We know a priori that the area under the black curve is the sum of two rectangles – a red rectangle and a blue rectangle. All we need to do is a simple fit, to determine the height, width, and center of the two rectangles. As you can see from the figure, there are two equally good solutions. There are two equally perfect fits. Alas, this leaves us with very considerable uncertainty about the area, width, and center of the blue rectangle. Some problems in this category can be solved by introducing some sort of regularizer, as discussed in reference 22. Additional examples to show how easy it is for people to fool themselves into “knowing” that they have “the” answer (when in fact they have not considered all the possibilities) can be found in reference 27. For more about problem-solving in general, see reference 1. One commonly hears advice along the lines of “don’t give up” or “Be more patient”. I consider that too simplistic, and too open to misinterpretation. It would be better to say that you need to develop judgement about when to give up. The school experience – especially the standardized “game-show” testing discussed in section 2 – gives many people the destructive idea that if it takes more then 45 seconds to solve a problem, they should give up. In the real world, you don’t get 40 questions in 30 minutes. That’s off by multiple orders of magnitude. More commonly you get 4 questions in 300 minutes, or something even beyond that. Therefore you must learn not to give up too soon. At some point you should give up. You don’t want to spend the rest of your life stuck on some problem that you can’t solve. If you don’t want to give up entirely, you can set the problem aside temporarily, and return to it later, after you have acquired more knowledge and skill. If you give up on the main goal you are admitting defeat. Many people are too quick to give up on the main goal. Many problems require exploring the possibilities. That involves choosing tentative, hypothetical sub-goals. If such a hypothesis doesn’t work out satisfactorily, you need to backtrack and redo the analysis, choosing the next item from the list of hypotheses. Many people are too slow to give up on an untenable hypothesis (and therefore too slow to begin consideration of alternative hypotheses). The process of exploring the hypotheses can often be formalized as searching a tree. More formally, this is called combinatorial search. Solving a Sudoku puzzle is a classic example of combinatorial search. Also, many chess problems involve searching a tree. Another example is exploring a maze. Giving up on dead-end sub-goals is absolutely necessary for making progress toward the main goal. Real-world problems are almost never cut-and-dried, and are almost never multiple choice. Open-ended questions predominate. Story problems predominate. Get used to it. Check all the plausible hypotheses. Consider all the plausible scenarios. Look at the problem from more than one viewpoint. The more open-ended the problem, the wider the range of hypotheses must be. You will get into all sorts of trouble if you pay attention only to evidence that supports your favorite hypothesis. (This is called “selecting the data” and it is a Bad Thing.) For each hypothesis, you should check equally diligently for supporting evidence and conflicting evidence. If a given hypothesis makes more than one prediction, check all the predictions. It is common to find a hypothesis that makes five different predictions, four of which are wrong. If there is no good reason for this, i.e. if the logic behind all five predictions is similar, then in all likelihood the hypothesis is fundamentally wrong, and the one correct prediction is just fortuitous. Indeed, the most dangerous models are the ones that get the right answer 99% of the time, in “normal” situations – and then betray you in some rare but critical situation. The problem with item 4 and item 5 is that this advice works better for experts than for students. Students, pretty much by definition, don’t have all the data, and they don’t have a full complement of theories to check against the data. If you leave non-experts to figure stuff out on their own, they run the risk of latching on to some oversimplified theory that explains some undersized set of data. You can’t fault them for this. At this stage they have no way of knowing that their simple theory will not survive when more data becomes available. Sometimes it helps to do “warm-up exercises”. That is, if you can’t do the problem as stated, try attacking a simpler similar problem. For example, if you can’t immediately see how to put 8 non-interacting queens on an 8×8 chess board, see if you can put 4 of them on a 4×4 board. Indeed, sometimes solving a small instance of the problem puts you in a position to solve all larger instances by induction. There may be more than one element in the solution-set. See section 7 and reference 22. Don’t panic if you need to know something that doesn’t appear in the statement of the problem. Figure it out, as discussed in section 10. Real-world problems are often overdetermined, underdetermined, or otherwise ill-posed, as discussed in reference 22. We want knowledge to be useful, which means you must be able to apply the knowledge when needed. We want memory to be useful, which means you must be able to recall the memory when needed. The key to having a good memory is to put stuff in to your memory in such a way as to facilitate getting it out of your memory when needed. Each of the associates is a hook to which [the memory] hangs, a means to fish it up when sunk below the surface. Together they form a network of attachments by which it is woven into the entire tissue of our thought. The ’secret of a good memory’ is thus the secret of forming diverse and multiple associations with every fact we care to retain. But this forming of associations with a fact, – what is it but thinking about the fact as much as possible? Briefly, then, of two men with the same outward experiences, the one who thinks over his experiences most, and weaves them into the most systematic relations with each other, will be the one with the best memory. [Italics in the original.] This (along with lots of other evidence) tells us that thought and memory are inextricably intertwined. Analytical thought requires facts; otherwise there is nothing to analyze. Conversely, the process of memorizing and recalling facts is itself a thought process ... and if done right, it is a rather deep though process. The cycle time for neurons in the human brain is on the order of 20 milliseconds. That’s 50 cycles per second. In contrast, there are many many thousands of facts that you can recall in less than a second, incluing names, phone numbers, vocabulary words, et cetera. That should make it obvious that recall is not a serial process. You do not run down a sequential list of facts, looking for the one you want. Instead, the recall process is massively parallel. Roughly speaking, it’s like posing a question to a very large audience: If any one person knows the answer, they raise their hand, and you receive the answer very quickly. In item 10 in section 9, the advice was to “figure it out”. Sometimes that’s exactly the right advice, especially if you are not accustomed to figuring things out, or if you didn’t realize that a given problem was figure-outable. Once you have begun the process of figuring things out, having somebody tell you “Figure it out” is no longer of much help. Learning to be smart is a long-term process. It is a lifestyle, in much the same way that the habit of healthy eating and regular exercise is a lifestyle. By the time you are facing a hard problem with a short deadline, it is too late. You cannot make yourself significantly smarter in the time available. If you want to improve your ability to recall things, you need to plan ahead. You need to make an extra effort at the time you encounter each new idea. If you wait until you need to recall the idea, making an extra effort at that time won’t help much. It’s too late. The idea is to live your life in such a way that you continually get smarter. One of the key ingredients is this: Every time you hear a new idea you should turn it over in your mind, looking for ways in which it is connected to other ideas. Make a note of which old ideas are consistent with – or inconsistent with – the new idea. The process of mulling ideas and looking for connections takes time and effort. Over a period of weeks and months and years, these connections will make you smarter. They will make you more prepared to handle hard problems. Let’s be clear that we are talking about something very odd: Forming a useful memory requires making a conscious effort to teach your subconscious what to do. The recall process is mostly subconscious ... but by consciously mulling over an idea you can form the connections that will allow the subconscious processes to work properly, later, when they are needed. Now that we have discussed useful learning, let’s say a few words about useless learning. As a first example, relying on cramming is a bad idea. Anything you learn in a couple of days you will forget a couple of days later. Cramming might improve your grade this semester, but it guarantees you will crash and burn next semester. If a “cram” situation ever arises, it tells you something very important: It means you need to change your lifestyle and change your learning habits so you never get into that situation again. As another example: Rote learning allows you to recall an idea in one way. As such, it counts as a memory, but it’s not a very useful memory. In contrast, mulling over an idea and establishing connections to other ideas allows you to recall the idea in 100 different ways, which is 100 times more useful. Reference 7 explains how a scaling argument based on figure 7 can be used to figure out the formula for the area of an ellipse. This leaves us with multiple ways of figuring out the area of an ellipse: You could just plain remember the formula from high-school geometry, and/or you could look it up, and/or you could easily reconstruct it whenever it is needed. I know some people who have quite bad memory who are successful physicists. They carefully remember a few fundamental facts, and rederive everything else on an as-needed basis. For example, with a little practice, you can rederive the formula for the area of an ellipse faster than most people can recall it from memory (and with less probability of error). It may be that some people develop extra-sharp thinking skills as a way of compensating for bad memory ... in analogy to the way that blind persons often develop extra-sharp hearing skills. However, I am not going to recommend bad memory any more than I would recommend blindness. Memory is a valuable skill. Obviously it is best to have a good memory and good thinking skills. Feynman said that knowledge is like a grand tapestry. A forgotten fact is like a hole in the tapestry. You should be able to repair the hole in several different ways, by reweaving down from the top, or up from the bottom, or in from the sides. Any important fact can be rederived in numerous ways, because our knowledge has numerous interconnections. Therefore: You should practice rederiving things. Even if it is something that you remember, rederive it anyway. This provides multiple advantages: First, it serves as a cross-check on your memory. Secondly, it builds up your thinking skills. Thirdly, it improves your understanding and recall of facts related to the one you are looking for, by exercising the all-important connections between facts. Remember that any important formula should be derivable in multiple different ways, so if you derived it one way last time, try to derive it another way next time. Some things can’t be derived, so you just have to remember them. Conversely, some things can’t be remembered, so you just have to figure them out. In particular, if/when you visit unexplored territory, it is nice to be able to derive new formulas on the spot. It is a really good feeling to know that even though you are in unexplored territory, you are not lost. Based on your good thinking skills, you can move around more freely than most people do in familiar territory. In contrast, the guy who tries to get by on memory alone, to the neglect of good thinking skills, will get seriously stuck as soon as he sets foot in unexplored territory, because the facts he needs are nowhere in his memory. Last but not least: There is no clear-cut distinction between remembering something and figuring it out. If there is any distinction at all, it is of zero importance. Memory is itself a thought process. Sometimes it is a subconscious process, and sometimes it is a recognizably conscious process, but there is no important distinction. As an example, if I need to know the square root of 40, I can never remember the numerical value, but I know at least two ways of figuring it out in my head. I can figure it out to 1% accuracy in less time than it takes to talk about it, and figure it out to 0.1% accuracy almost as quickly. There’s thinking involved, but not much in the way of creative thinking, because I know exactly what procedures to use. You could ask whether this counts as memory, or as thinking, or both ... but the answer doesn’t matter. Once upon a time, there was a sophomore who heard that fruits and vegetables are good for you. So he ate nothing but apples and celery for three months. Then he died. I beg to differ. I still think fruits and vegetables are good for you. The problem was not what the guy ate ... the problem was what they guy didn’t eat. Do not confuse the presence of apples and celery with the absence of a balanced diet. Let’s turn our attention now to understanding, and now it relates to algorithms, mnemonics, formalism, et cetera. I’ve heard math teachers tell me, in all seriousness, that long division is evil, because it is an algorithm, and all algorithms are mindless. (If you want to know how I do long division, see reference 8.) I get really tired of hearing that. I’ve heard chemistry teachers tell me that students should not be allowed to use Gaussian elimination to balance chemical reaction equations, even when the number of variables is huge, because that would be an algorithm, and all algorithms are rote, and rote is evil. I get really tired of hearing that, too. I’ve heard physics teachers, in all seriousness, use the word “algorithms” as an antonym for understanding. I get really tired of hearing that, too. My point is that properly-chosen algorithms / mnemonics / equations / procedures / formalisms / methods are good for you. Really they are ... just like fruits and vegetables are good for you, as part of a balanced diet. If a student has some formal tools but lacks a gut feeling for how things work, the problem is not what the student has ... the problem is what the student doesn’t have. Everyone needs a balanced diet. That is, everyone needs gut feelings and formalism. Without some gut feeling, you wouldn’t know how to derive the equations. You wouldn’t even know which equations were worth deriving. And you wouldn’t know how to use whatever equations you were given. Without the formalism, you have no good way of knowing whether your gut feelings are correct. Furthermore, if you’re not methodical, errors will creep into your work. 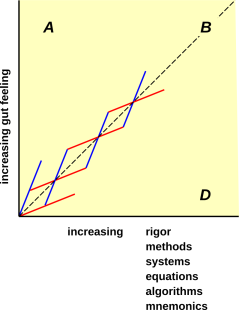 Real understanding is represented by point B, in the upper-right corner, where there is a high level of feeling for the subject backed up by a high level of rigor. As indicated by the red and blue arrows, you don’t get to the goal in one step. You start out with a little bit of feeling and a little bit of formalism. They reinforce each other and provide a foundation for the next step. The red leverages the blue and the blue leverages the red. And so you itsy-bitsy-spider your way up and over toward point B. There is a problem – day in and day out – with people who do not have enough feeling for the subject. This is a problem, to some extent, everywhere and at all times. Feynman railed about this at every opportunity. For example, he discussed the Brazilian version of the problem in reference 28. The problem is not what the students have; the problem is what they don’t have. They don’t have a feeling for the subject. This situation is represented by point D in figure 8. It sometimes goes by the name “rigor mortis”, which is a pretty good name for rigor without feeling. At the opposite extreme, there is also a huge problem when people try to get by on their gut feelings, to the neglect of formalism, algorithms, mnemonics, et cetera. This manifests itself in many ways. As an example, sometimes people sling buzzwords around without any real understanding. If they had checked their feelings against the theory, they would have known their feelings were nonsense. Many additional examples are classified under the educationalese term “negative transference”. That means your gut feeling based on experience in one domain might give you the wrong answer when applied in another domain. Your gut might tell you steering a sailboat is the same as steering a car. It’s not. 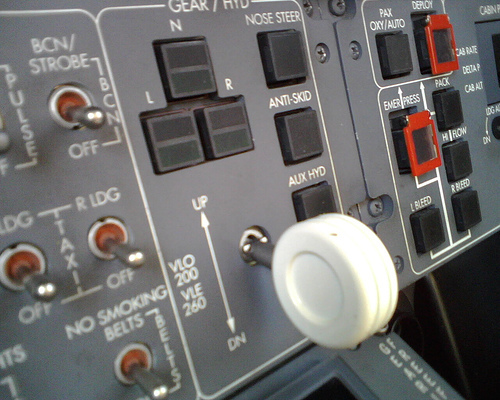 Your gut might tell you steering an airplane is the same as steering a car. It’s not. Your gut might tell you there is a ball-and-stick model of electrons in an atom just like there is a ball-and-stick model of atoms in a molecule. There isn’t. I’m not saying that gut feelings are bad. I’m saying that gut feelings have to be checked against the facts. Also, I’m saying that sometimes having some sophistication gives you useful information about the limits of validity of your gut feelings. This sheds some light on the so-called “new math” and its relationship to “old math”, which has remained an unsettled issue since the 1960s. (If you’re interested in the history of this, reference 29 is a reasonably informative, non-hysterical, non-polemical news article.) This issue is commonly referred to as the “Math Wars” but I don’t like to use that term. The warlike aspects are a discredit to everyone involved. The sensible approach is to use smart, efficient algorithms2 and to understand the principles involved. Some people object to algorithms because they can be memorized. Of course algorithms can be memorized, but that’s usually irrelevant, sometimes an advantage, and never a disadvantage. As mentioned in section 10.2, I don’t recommend doing away with memory, for the same reason I don’t recommend blindness. Memory is not the opposite of thought, nor the enemy of thought. Using an algorithm is not necessarily the non-thoughtful approach; usually it is the most thoughtful approach. Algorithms are like tools. When I tighten a bolt, I use a wrench. That does not make me any less skillful than the guy who tries to tighten the bolt with his bare hands. I’m allowed to use the wrench, even though I didn’t invent it or even manufacture it. Continuing that thought: There have many occasions where I did invent and construct a specialized wrench or other tool to solve a specialized problem. Building custom tools and jigs requires an investment, but often this approach pays off handsomely, leading to overall faster and better results, compared to the brute-force head-on approach. You should never use “equation” as a synonym for plug-and-chug. You should never use “algorithm” as a synonym for mindless. You should never use “systematic” as a synonym for rote. If you mean rote, say “rote”. If you mean mindless, say “mindless”. If you mean plug-and-chug, say “plug-and-chug”. Having a tool does not oblige you to abuse the tool. You must not blame the presence of one tool for the absence of another. A tool that is well-suited for “Task A” might be laughably ill-suited for “Task B” – and vice versa. It’s your job to figure out which tool to use for the task at hand. This requires judgement. Using Cramer’s rule as a numerical algorithm is not so clever. Non-systematic non-methodical fiddling with the equations is not clever at all (especially for large N). Press, Teukolsky, Vetterling and Flannery wrote a book called Numerical Recipes that you may have heard of. I know these guys; They are famous for their understanding, not lack thereof. Feynman diagrams are basically an algorithm for organizing a bunch of calculations. Suppose you are doing numerical integration of the equation of motion for (say) a harmonic oscillator, or the Kepler problem. you could use a symplectic Verlet algorithm, which is exactly the same amount of work, but produces a better result, better by many orders of magnitude. This is relevant to any discussion of why it pays to be smart and well educated. Any dummy can do a crude numerical integration, but once you start doing it there is a tremendous incentive to use a smarter algorithm. If you don’t know some physics, you have no idea what phase space is or why a symplectic integrator is advantageous. If you don’t know some algebra, you can’t even be part of the conversation about second-order versus first-order. An algorithm is like a tool, much like a piano is a tool for making music. Having a powerful tool doesn’t automagically make me a good musician, but it doesn’t make me worse. Having the tool does not preclude me from having a feel for the music, based on artistry as well as understanding. So it is with physics formalism and mathematical algorithms: Using the tool does not automagically bestow understanding, but neither does it detract. By using the tool wisely, you can get a lot more done. When I teach a kid to ride a bike I do not first require him to build the bike from scratch. When I teach a kid to play the piano I do not first require him to build the piano from scratch. By the same token, when teaching kids to do physics, I do not require them to reinvent all the formalism from scratch. I often cook without a recipe, improvising based on what’s available and on the whim of the moment. On the other hand reading a cookbook won’t make me a worse cook, and quite likely will make me safer, make me more efficient, and produce a better end-product. Algorithms do not prevent understanding, but neither do the bestow it ... or even require it. Physics formalism is very powerful. Everybody, present company not excepted, uses the formalism without fully understanding it. Feynman said he didn’t really understand quantum mechanics (even though, relatively speaking, he understood it better than anyone else alive). Newton did not pretend to attribute any deep meaning to the law of universal gravitation (“hypotheses non fingo”). I daresay a lot of other folks are in the same boat or worse, yet we are proficient at using the formalism to get good results. In any case, as the proverb says, it is a poor workman who blames his tools (or his algorithms). Sometimes there is a legitimate need for a crutch. That can happen if somebody has a broken leg .... after you have taken direct action to treat the underlying malady and provided you have briefed the user on the correct usage and limitations of the crutch. On the other hand, crutches can actually cause secondary injuries, especially if overused or abused. For a person with normal abilities, a crutch is worse than useless. It gets in the way, and hinders development of normal performance. So ... there are upsides and downsides to crutches. We should not over-react to the upsides or the downsides. I’ve seen some algorithms – such as the infamous “density triangle” – that should be categorized as crutches. They may be useful in some rare, temporary situations, but otherwise are worse than useless. If you see somebody using a crutch that is not really needed, it is a good idea to wean them off the crutch, sooner rather than later. If the student actually wants a more detailed answer, he can always ask a more detailed question. In section 10.3 we argued that memory is part of thought (not the opposite of thought or the enemy of thought). Similarly we argued that algorithms and methods are part of thought (not the opposite of thought or the enemy of thought). These parts reinforce each other in a lattice, as shown in figure 8. The same applies to creativity. Not all thinking counts as creative thinking, but if you are going to do any creative thinking, it will necessarily be based on a foundation of memories and methods, of gut feelings and algorithms. Most inventions can be described as pushing forward the frontier of knowledge. In order to do this, you need to know where the frontier is! In almost all cases, usefully original thinking is not wildly original. For example, Beethoven is famous for breaking the rules of classical music theory ... but he did not break all the rules at once. He broke a rule here and a rule there, in crafty and purposeful ways. Any discussion of critical thinking must necessarily cover much of the same ground as a discussion of scientific methods. See reference 10. Consider the following scenario: I pose the “Mississippi Flow” problem to two different people who have nominally similar educational backgrounds and experience. The usual case is that I work with the person for 45 minutes, telling them “don’t give up” and “if you need to know that, figure it out” ... and giving a series of hints. At the end of this time, they have a solution. They realize in retrospect that in principle they could have solved the problem, in the sense that they knew everything necessary to permit a solution. At the same time, they realize that in practice they could never have found the solution on their own, because they would not have been able to organize their thinking in such a way as to call attention to the relevant facts. In a not-very-small minority of the cases, the person can solve the puzzle very very quickly. They outline the method of solution in about four seconds, and then take another few seconds to carry out the required multiplications. The fact that proficiency with this sort of problem-solving is so unevenly distributed makes this sort of problem difficult to discuss in a classroom situation. The class as a whole, working as a team, can solve the problem relatively quickly, but that defeats one of the major purposes, namely giving each person experience racking their brain to find and organize the required bits of information. I don’t really know how to solve this problem. It would be ideal to spend 45 minutes with each student one-on-one, going over this puzzle, but that would be prohibitively expensive in a typical school setting. Many puzzles have the unfortunate property that even if you solve the puzzle, it’s still just a puzzle. The reward for solving it is trivial, artificial, or very indirect. Most homework problems are in this category; that is, the teacher already knows the right answer, and is not going to make any life-or-death decisions based on the student’s answer. In many real-world situations, there is a lot riding on the question. It may truly be a life-and-death decision. As my friend Larry says: If it’s not worth doing, it’s not worth doing right. If it’s really worth doing, it’s worth double-checking to make sure you did it right. Consider someone who is learning to ride a bike. Why are they doing it? They typically are not doing it for the challenge; they are not doing it because the learning process is difficult. They are doing it because being able to ride a bike will empower them to go places and do things they could not do otherwise. Problem A is hard, and the solution is worth $10.00. Problem B is hard, and the solution is worth $100.00. Problem C is easy, and the solution is worth $10.00. Problem D is easy, and the solution is worth $100.00. Given the choice, I would prefer problem B over problem A every time. That is, we should not value puzzles because they are hard; instead we should value puzzles if and when the answer is important. Homework problems have indirect value if (and only if) they teach skills that will have direct value later. It is also true that given the choice, I would prefer problem C over problem A. Easy problems are preferable to hard problems, other things being equal. Of course problem D is the most preferable of all. More generally, I need to do a cost/benefit analysis. Given the choice between an easy, low-value problem and a hard, high-value problem, a tradeoff must be made. Making wise tradeoffs requires analysis and judgement. In any case, we need to maintain a clear understanding of what is primary versus what is secondary, what is directly valuable versus what is only indirectly valuable, and what is real versus what is artificial. The idea is neither to work harder, nor to work less hard. The idea is to get more done, by being clever. Things that formerly seemed difficult become easy once you know how. Above all, you should learn to solve important problems. For more on this, see reference 31. Some of these are interesting because they have more than one answer, i.e. the solution-set is not a singleton. Others are interesting because even though there is only one final answer, there are multiple methods of solution. Others are interesting because they require outside-the-box thinking. Note that some of these are more challenging than they appear. I’ve seen some famously smart people get them wrong. I have a quantity x such that x2=81. Please tell me the value of x. How do you know? How sure are you? The task is to draw a path consisting of four straight contiguous line segments, such that the path goes through all of the dots. Given a barometer, how many different ways can you think of for measuring the height of a building? This is a classic, although the original story (reference 32) set up the question differently, not quite so directly. Please give me an estimate of how much Mississippi River water flows past New Orleans in a year. This is a closed-book question; don’t look anything up; figure it out. Once upon a time a farmer went to market and purchased a wolf, a goat, and a cabbage. On his way home, he came to a river crossing where a small boat was available. The boat was so small that the farmer could carry only himself and a single one of his purchases : the wolf, the goat, or the cabbage. If given a chance, not in the farmer’s presence, the goat would eat the cabbage, and the wolf would eat the goat. The goal is to keep all of the purchases intact and get them to the far side of the river. How would you do it? The “cannibals and missionaries” problem is similar. It permits fewer outside-the-box solutions, which is usually a bad thing, but might sometimes help somebody get out of a rut. There are a number of other “river crossing puzzles”, and more generally a vast number of “transport puzzles”. You start out at point A. You travel strictly south for one mile. You then make a right-angle turn and travel strictly east for one mile. You then make another right-angle turn and travel strictly north for one mile. It turns out that you are now back at point A. So, please tell me, where is point A? How do you know? How sure are you? Note: For present purposes, we approximate the earth as being perfectly spherical. 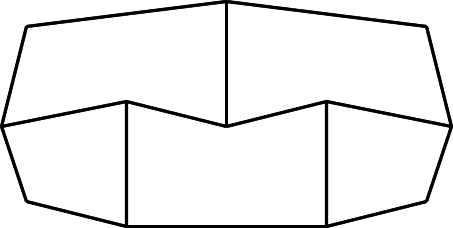 Point A is on the surface, and all travel takes place along the surface. Pencil and paper only. No calculators or computers of any kind allowed. [Worked Example] In figure 9, I have connected the dots to make a square with one unit of area. You may take this as the definition of what we mean by unit area. [Your Task] Connect the dots to make a square with four units of area. Label it appropriately. 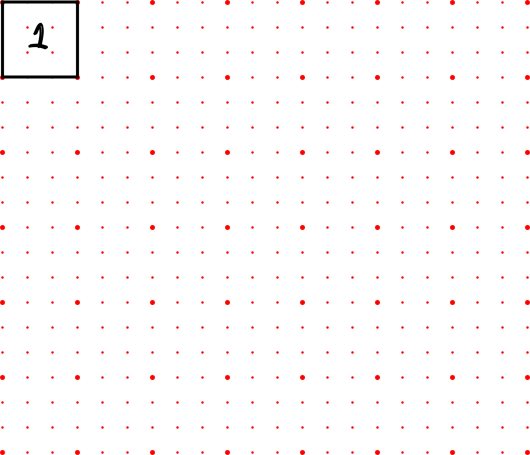 [Your Task] Connect the dots to make a square with two units of area. Label it appropriately. [Your Task] Connect the dots to make a square with five units of area. Label it appropriately. Bongard problems (reference 33) have the advantage that they don’t require much if any domain- specific knowledge, so you can use them on Day One of the course. Also, there are many dozens of them (unlike the Mississippi Flow problem, which is a one-off). The disadvantage is that Bongard problems are artificial puzzles. The downside to puzzles and games is that even if you win the game, it’s still just a game. The idea here is to use Bongard problems as scaffolding, to allow students to feel what it’s like to deal with open-ended problems. In the long run they won’t need the scaffolding, because there are plenty of real-world problems begging to be solved. Students generally enjoy Bongard problems. They teach some useful thinking skills, including the necessity of looking at a problem from more than one viewpoint. Here’s a challenge of a different kind: Can you draw a continuous path that crosses each of the line segments in figure 10, crossing each one once and only once? Crossing at the corners is not allowed. 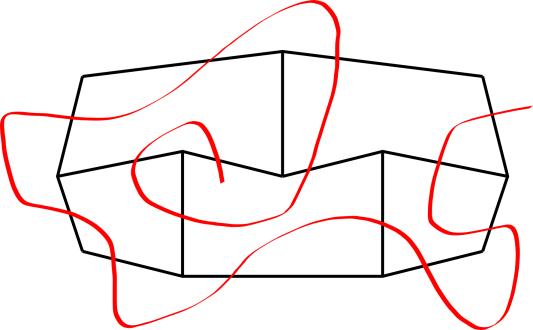 The path shown in red in figure 11 is almost – but not quite – a successful solution; it fails to cross the middle vertical line segment. Can you do better than this? Let’s talk about creativity, originality, artistry, and imagination. These topics are closely related to the idea of open-ended questions and to the larger idea of critical thinking, in ways that will be discussed shortly. Whenever (in section 15.2 or elsewhere) I talk about “the building block approach”, please imagine a child building something out of Legos ... something complicated and imaginative. The question of what to build and how to build it is open-ended. There is an astronomical number of right answers. In contrast, please do not imagine a menial laborer building a brick wall. In this situation, if you ask where the next brick comes from, there is usually only one right answer. Similarly, if you ask where the next brick needs to go, there is usually only one or two right answers. With the Legos, reducing it to a step-by-step, multiple-choice, checklist-oriented activity would spectacularly bad. It would remove the spontaneity, creativity, and open-endedness. With menial bricklaying, multiple-choice questions might be perfectly appropriate. Here’s another analogy: At many universities, the music department offers a “music appreciation for dummies” course. The students listen to music and talk about it. There is little if any open-endedness. This stands in contrast to the course in “composition and orchestration” that is taken by music majors, by real musicians, where originality and artistry are required. There is a great deal of structure, but also a great deal of open-endedness. they cannot imagine that there ever could be any creativity or imagination (let alone artistry) in physics. I insist that it doesn’t have to be this way. Physics, even at the introductory level, does not have to be a mindless, joyless, multiple- guess activity. Anybody who has more than a day of experience in the teaching profession (or any other profession) knows what it’s like to deal with open-ended questions. Everybody on this list knows in their bones how to do it. There may be some questions about how best to teach this idea, but that is to be expected. There is no checklist for teaching open-ended thinking. There is no rote method for teaching critical thinking. There is no paint-by-numbers method for teaching artistry. On the other hand, there are some tried-and-true ideas that we can keep in our bag of tricks, and there are some known pitfalls to be avoided. The following sections contain suggestions from the keen-grasp-of-the-obvious department. In the first phase, break the task apart into simpler elements. Learn each element separately. In the second phase, put the elements together to complete the task. The first phase of this approach (learning the individual building-blocks) is not sufficient. You also need the second phase, namely putting the blocks together to complete the overall edifice. As an aid to the second phase, consider the “Music Minus One” approach as described in reference 34.
while I do N−1 of the tasks, the student takes care of the one remaining task, e.g. et cetera, gradually increasing the level of responsibility and complexity. completely abandoning the idea of teaching them to actually swim. There are lots of more nuanced approaches, whereby they gradually learn how to swim. The building-block metaphor is continued in section 15.3. Here are two more fallacies, which are in some sense mirror images of each other. As usual, both extremes are wrong. At one extreme is the repertory-only approach, aka learning-by-doing, aka the problem-solving-only approach. Imagine trying to learn a new subject, reading nothing but the Schaum’s outline. This is nuts. You need more explanation than that. You need more theory than that. At the opposite extreme is the principles-and-concepts-only approach. This corresponds to giving the kid an enormous set of Legos, enough in principle to build almost anything ... but not allowing him to ever actually build anything. This is also nuts. If the principles and concepts are not used for interesting and important applications, there will be zero motivation and zero retention. As a more positive way of saying the same thing, you need teach both principles and applications, so that applications illustrate and motivate the theory, and the theory enables and explains the applications. At this point I do the itsy-bitsy-spider thing with my hands. Physics principles are like legos, or like full-scale masonry building blocks. Individually they aren’t very interesting. Even a large pile of them is not very interesting. The interesting part comes when you combine them in artistic ways to build something. Analogies aside: The thing that makes physics interesting, the thing that makes physics physics, is the fact that you can learn a surprisingly small amount of basic principles and then combine them in complicated multi-step chains of reasoning to figure out interesting stuff. If the student is given nothing but lego-shaped holes into which they must plug one individual lego, then the whole program is worthless, and we might as well get rid of the legos. However, that seems like curing a headache by amputation. If the student can answer the exercises by equation-hunting, there’s nothing wrong with the student and there’s nothing wrong with the equations ... but there’s something gravely wrong with the exercises. Real-world questions are not like that. A course that focuses on concepts only, in the absence of reasoning, is like a disorganized pile of legos. Students will find it boring and useless, and rightly so. They will remember none of it. One has to wonder, what’s the point? Why bother? Students will put a lot more effort into the course if the see that it’s actually good for something. Suppose you don’t know anything about how to play the piano. Now imagine plopping yourself in front of a grand piano and trying to play the Hammerklavier sonata (reference 35). If you believe in the direct approach, you start by playing just the first note. That’s doable, right? Then you play just the first two notes. That’s doable, right? Then imagine working your way through the whole piece that way. If at first you don’t succeed, try harder. TRY HARDER! Alas, that is not going to work. Instead you need to back up many many steps and approach the problem indirectly, using ultra-simple level-1 pieces and lots of scales and études. This is indirect because later, after you have mastered the masterpieces, it is OK to forget the level-1 pieces. They are are not wrong and do not need to be unlearned; they just get left behind or integrated and absorbed ... just as a chick leaves behind its shell and absorbs its yolk-sac. Another term for this is scaffolding: To assemble a huge statue, you need scaffolding ... but afterwards you remove the scaffolding. It’s not needed anymore, and it just gets in the way. You can call this unlearning if you want, but it’s the ultra-simple non-problematic kind of unlearning, because it’s obvious which part is statue and which part is scaffolding. It’s obvious what you need to remove. There is nothing confusing or deceptive. Remark: Only on the rarest of occasions does it help to tell a student to “TRY HARDER”. Usually the problem is that the kid doesn’t have the requisite foundation. You have to go back and build the foundation. To say the same thing another way: Putting more effort into an approach that isn’t working is worse than useless. See section 9 for more on this. Remark: The scales-and-études approach is indirect in another way: There is some sort of Cartesian direct product. Imagine a matrix with N rows and M columns. Studying N different scales and études prepares you to play M different repertory pieces. There is not a one-to-one relationship between a given étude and a given sonata. That leads us back to the topic of open-endedness. There are plenty of things in the world that are not open-ended. If you are the home plate umpire, for every pitch you need to call “ball” or “strike”. It’s multiple choice. You can’t split the difference. building something original and artistic out of Legos. Building a trebuchet out of popsicle sticks and glue. The notorious “Mississippi Flow” exercise (section 14.4). We need to emphasize open-ended problems in order to restore balance, because in recent years closed-ended checklist-oriented multiple-guess problems have been grotesquely overemphasized. Suggestion: Whenever selecting or creating quiz questions, include a goodly proportion of open-ended questions. Whenever I see a multiple-guess question, I wince, and then ask myself whether it could be converted into an open-ended question. If you say multiple-choice questions save a lot of time, because they are easier to grade, then I respond as follows: If we are going to talk about savings, we need to talk about the costs, too. The cost of overemphasizing short-answer multiple-guess tests is that they defeat the purpose of the entire educational system. The cost exceeds your entire salary plus overhead and more than that besides. Ask the kids whether they would rather learn a small number of truly useful things, or be “exposed to” a huge number of useless things that they won’t remember anyway. Besides, consider the options for a 50-minute test: You could assign 65 multiple-guess questions (45 seconds apiece) or you could assign 4 open-ended questions (12 minutes apiece). You may find that grading the 4-question version does not take much (if any) longer than grading the 65-question version. As mentioned in section 3, the critical thinking must be baked into the thinking process, like the oatmeal in oatmeal cookies, not sprinkled on as an afterthought. So it is with the teaching of critical thinking: It has to be baked into the curriculum. It is not something you can advocate for 15 minutes on Tuesday morning and then ignore – or penalize – the rest of the time. Combining several of the items mentioned in section 15 and elsewhere, we come back to the idea that 99.999% of reasoning is massively parallel and subconscious. Consider the Mississippi Flow problem. Most people have a very hard time with this problem. Solving it involves racking the brain and sifting the memory, searching for information that is somehow related to the problem. If on Day One of the course you ask students to do this, they can’t do it, and pestering them to “try harder” won’t help ... and the direct approach won’t work either. This problem doesn’t rise to the Hammerklavier level of complexity, but the same idea applies: Rather than attacking it directly, you need to go back and spend a long time working on scales and études so as to build up the skills necessary to attack the problem. More specifically: You can’t fetch stuff out of your memory in a good way if you didn’t put it into your memory in a good way. This helps explain why the current overemphasis on fully-scripted problem-solving and multiple-guess quizzes is so poisonous. If there is a script for solving every problem that is going to be on the state test, then students naturally get the idea that rote learning is sufficient. The hallmark of rote learning is that each idea can be recalled in exactly one way. Technically that counts as a memory, but it is not a very useful memory. As discussed in section 10.1, the smart approach is to mull over each new idea, checking it against previously-known ideas, looking for connections ... and, conversely, checking for inconsistencies. If you do this, each idea can be recalled in 100 different ways, which makes it 100 times more useful than a rote memory. if you didn’t put it into your memory in a good way. The point is, you need to make it a habit to give every new idea this treatment. Don’t wait until you have cavities to start brushing your teeth. Don’t wait until you are facing an open-ended question to suddenly wish you had a more agile, effective mind. Wishing won’t help. This is one of the many things I like about the Harry Potter stories: the kids didn’t get to be powerful wizards overnight. They didn’t do it by praying or wishing. They worked hard for years to develop their skills, including reasoning and teamwork as well as the more domain-specific skills. There is a bit of a chicken-and-egg problem here, because until the students learn how to build up richly-connected memories, they won’t be very good at solving open-ended problems ... and conversely, until they have some success at recalling off-the-wall and out-of-the box ideas, they won’t appreciate the value of richly-connected memories, and won’t be motivated to do the work – the years of work – necessary to build such memories. Here is a bit of an exercise: The association game. Call on students, in order, so that everybody has to participate. The assignment is to come up with some word or idea that is associated with the Mississippi. Kids who are called on later have the advantage of more time to think, but the disadvantage that the low-hanging fruit has already been picked. Then we can go back and take those items two at a time, looking for other connections. In particular, what do riverboats and Huckleberry Finn have in common? What does that mean? Could that possibly help solve the Mississippi Flow problem? Don’t tell me students can’t play this game. They play six degrees of Kevin Bacon for fun. The downside to 6∘KB is that even if you win, it’s still just a trivia game. What we’re doing here is just as much fun, but it’s better because it’s not just a game. We are building up the skills needed to solve important real-world problems. Students (and parents etc.) get irate if they think you are cheating, if they think you are not playing by the rules. You don’t show up to play football wearing your baseball uniform and carrying your bat and mitt. It’s a different game, with different rules, different skills, and different equipment. So it is with this class. You’ve spent 12 years learning how to play trivia games, and there’s nothing wrong with that, but in this class we are playing a whole different game. It has different rules, and requires different equipment and different skills. For starters, rather than flirting with a large number of trivial problems, we are going to solve a small number of important problems. There will be lots of open-ended questions, and relatively few multiple- guess questions. There will be few if any questions that can be answered in 45 seconds. Creativity and originality will be encouraged. We do not choose problems because they are hard, or because they are easy. We choose problems that are important. If you can find an easy solution to an important problem, that’s the biggest win of all. That’s what we call low-hanging fruit. I love low-hanging fruit. I go for the watermelons, because they are huge and delicious and very, very low-hanging. In this class, we do not do hard problems. We will sometimes do problems that would have been hard if you didn’t know the tricks. So let’s get started. Let me show you a few good tricks. You’ll have to give that speech multiple times before anybody believes you ... and then you have to deliver. They’ve heard (most of) that speech before, from people who didn’t mean it and/or didn’t even understand what they were saying. Also at some point it is necessary to explain what I mean by “good tricks”. Good tricks help solve lots of important problems. If the trick can do that, it’s a good trick, and I don’t care whether you call it physics or non-physics. Mathematicians think that all of physics is just a bunch of tricks for guessing the right answer without doing a mathematically-rigorous proof. I take it as a compliment, even if it was not intended as such. by “canceling” the sixes. Even when it works it’s a ridiculous method. Rote memory counts as a memory, and sometimes it is exactly the right approach, but it comes at a terrible cost. It’s not very scalable. You could make a list of all 500,000 questions that could be on the final, and if you want to memorize and retain all of the questions and answers, Rain Man style, that’s fine with me. However, if your name is not Rain Man, you will find it easier – a whole lot easier – to learn a handful of deep principles and learn how to apply them. According to legend, when they (separately) faced the Kobayashi Maru scenario, Ensign James T. Kirk and Ensign Montgomery Scott each found ways of «solving» the problem that depended in the fact that it was a simulation, not a real situation. In other words, they converted an important problem into an unimportant problem and quote «solved» it. That is the opposite of good behavior. That is not a survival skill in real life. Our goal is to convert hard important problems into easy important problems. It has to remain important or it’s not worth the trouble. And by the way, at any decent school, if something goes wrong with the simulation, you do not get credit for a win. We come up with a better scenario and you get to start over. Life is not some made- for-TV courtroom drama where the objective is to win on a technicality. Suggestion: On occasion, assign the same exercise more than once, with instructions to find the answer by a different method. This is not easy, but it can undoubtedly be done. For example, more than 250 different proofs of the Pythagorean theorem are known. Discuss the various solutions. Start by deciding which are correct ... but don’t stop there. It is also appropriate to evaluate the degree of originality ... but don’t stop there, either. 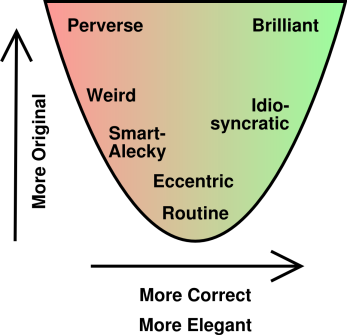 As shown in figure 12, we don’t want to cultivate originality just for the sake of originality; we want to cultivate correctness, style, and elegance. Originality without correctness is the domain of kooks and crackpots. Originality without good style is sometimes perverse and sometimes just weird. Good style is subjective, but it is nevertheless real and important. For more about the role of style, elegance, and artistry in science, see reference 36. Einstein complained that his teachers required Kadavergehorsamkeit – the obedience of a corpse. Once upon a time, I was helping a kid translate a sentence for his Spanish homework. He thought of two possible translations: the literal translation, and the fluent translation. He immediately wrote down the literal translation. I thought the fluent translation would be better, because in real life, nobody with any sense would use the literal translation. The teacher speaks Spanish; she will know this is better. Everybody else is going to do use the translation in the back of the book. If I do that, it will be marked correct. If I do anything else, it might or might not be marked correct. I could argue the point, and I might even win, but then I get the reputation for being argumentative, which is not good. By the time she gets around to grading the papers, she will have forgotten what the question was, so it doesn’t matter whether she speaks Spanish or not. The most important thing is to get the same answer as everybody else. Just because you think the fluent translation is better doesn’t mean the teacher thinks it is better. Maybe in your world it is better, but in my world there is a downside and no possible upside to the fluent translation. I told the kid he was right, and apologized for giving bad advice. We briefly discussed the difference between what works in school and what is the right thing in real life. We discussed the possibility of providing the second translation off to the side, or as an appendix, or asking about it in class. The kid stuck to his position: That school’s motto is “the nail that sticks up gets hammered down” and nothing was going to tempt the kid to stick his head up. The lesson here is simple: If you want kids to learn to think, you have to reward the fluent translation. Also explicitly mention that it is possible to have more than one correct solution to homework questions. Ask in class if anybody has any questions. Ask if anybody can come up with alternative approaches. It is not sufficient to merely say you want such things; you have to practice what you preach. Merely tolerating it would be an improvement over what we have now, but actually rewarding it would be even better. If you want kids to not learn by rote, you must not grade by rote. I am quite aware that this requires the teacher to do more work. It is, however, necessary work. Here’s a constructive suggestion that is simple yet super-important: Start by removing the thousands of little things that reward conformity and rote regurgitation while penalizing creativity and critical thinking. You don’t have to remove all of them at once; just remove them a few at a time, as you come to them, all day every day. For example, all too often on page 101 of the textbook there will be a definition, and then on page 105 there will be an “exercise” that calls for regurgitation of the definition, word for word. Suggestion: don’t assign that exercise. Come up with some exercise that requires applying the idea rather than memorizing empty words. If you can’t come up with such an exercise, then the idea must not be very important, and you need not assign any exercise whatsoever on that topic. The usual textbook treatment of “significant figures” is nonsense ... and the students know it. Any student with reasonable critical-thinking skills can figure out that the sig-figs rules don’t work. The more the teacher emphasizes “sig figs” the more he loses credibility and trust, and the more firmly the students learn that critical thinking is not tolerated in school. See reference 37. The usual textbook discussion of “the scientific method” is a travesty. It makes a mockery of science, of critical thinking, and of common sense. See reference 10. In the introductory chemistry class, asking students to distinguish “chemical change” from “physical change” on the basis of qualitative, macroscopic observations is just ludicrous, and the students know it. They know it because the examples given in the book do not uphold the rules given in the book. See reference 38. Et cetera. There are so many misconceptions that it would be impossible to enumerate them, let alone discuss them. Reference 39 lists a few dozen particularly pernicious misconceptions. Even misconceptions that are not acutely life-threatening are harmful in the long run, because they add up, drop by drop, convincing students that critical thinking is not tolerated in school. Another suggestion: Set up a program that rewards students for finding errors in the textbook. The reward should depend on the importance of the error: One point for simple spelling errors, and many points for fundamental misconceptions. Similarly, assign students to find examples of nonsense in real life. There are plenty of blatant examples, including advertisements for “low calorie energy bars” and so forth. The aisles of a typical drug store contain homeopathic “drugs”, magnetic-therapy bracelets, and many other products that could not possibly work as advertised. Many news articles cannot keep straight the distinction between a millisievert and a millisievert per hour. Politicians promise to reduce taxes and balance the budget without cutting government programs. More subtle forms of nonsense are even more abundant. Last but not least, get rid of the high-stakes game-show tests, as discussed in section 2. One thing that poisons the system is the idea that “practice makes perfect”. That is, all too often, students and teachers alike think that the best preparation for the test is to do things similar to the test over and over again. Alas, this is a terrible approach. First of all, there is heavy time pressure on the SAT and similar tests, so in that context the students are well advised to not take the time to ponder and/or play. Secondly, during the test there is no reward for showing the work, and not enough time to do it. This teaches exactly the wrong lesson about the importance of showing the work. One thing that helps a little bit is to explain the distinction between knowledge-in and knowledge-out ... that is, between learning and recall. The test measures your ability to pour knowledge out of your head, as quickly as possible. The skills necessary for this task are wildly different from the skills necessary for putting knowledge into your head. The two ideas are linked, but only very indirectly. They are linked because you can’t get knowledge out efficiently unless you put it in properly. Still, the point remains, the procedures for knowledge-in are very different from the procedures for knowledge-out. The former absolutely requires mulling each new idea, to see how it connects – and how it conflicts – with other ideas. See section 10.1. This takes time and effort. It requires making lots of connections, because you rarely know in advance which connections will pay off. Another thing that helps a little bit is to explain the difference between test-prep and life-prep ... and to explain about burning the furniture. In the short term, if you are in danger of freezing to death, burning the furniture is a reasonable tactic. In the longer term, the only reasonable strategy is to make sure you get into such a desperate situation. Cramming for a test might make sense in an emergency, but it is like burning the furniture. I’m not even sure it’s good test-prep, but I guarantee that it’s not good life-prep. Cramming is a bad practice, and it should be avoided like the plague, except maybe in emergencies. Anything that is quickly learned will be quickly forgotten. Unless it is an absolute emergency, your life will be better if you spend the time properly learning a few things, rather than pseudo-learning a whole bunch of things. Require showing the work, checking the work, and showing the checks. Students will eventually internalize this, after they see the value of it ... but in the introductory class, they should be required to do it, even before they see the value of it. As discussed in section 16.3, tolerate nonstandard answers, if they are not significantly worse than the standard answers. Reward real-world answers in preference to rote answers. Set up a system that rewards students for reporting serious errors in the text, or (gasp) in what the teacher says in class. Assign a given problem once, and then assign the exact same problem again, with instructions to find a completely different method of solution. Offer an SAT prep class that is not concentrated in the days or weeks leading up to the test. Offer it to the 9th and 10th graders, so that you can make timely suggestions on how to learn and how to think ... suggestions about life-prep, not just test-prep. You can play Six Degrees of Kelvin Baryon in class, where the explicit objective is to look for connections between things. how is the first law of motion related to the second law? how is the first law related to conservation of momentum? how is action/reaction related to conservation of momentum? how is Coulomb’s law related to conservation of momentum? These questions do not even remotely resemble SAT questions or FCI questions, but thinking about them puts you in a much better position to answer such questions, and a lot of other questions besides. The most important life-prep lesson is this: As a student, the key to doing better on the test does not consist in working harder during the test. Instead, what really matters is how you lead your life in the months and years leading up to the test. If you ponder stuff and play with stuff, that makes you smarter, bit by gradual bit. Then when the test comes around – and when real-world challenges come around – you will have a much easier time. Claudia: You’re worried that we’ll screw up royally tomorrow, aren’t you? Jaime Escalante: Tomorrow’s another day. I’m worried you’re gonna screw up the rest of your lives. Thinking is hard. Teaching and learning are hard. Teaching and learning critical thinking skills is particularly hard. We need to do these things, even though they are hard. Some specific suggestions and hints on how to do this were presented above. See the table of contents. I am all in favor of testing and assessment – provided it is done properly. I am all in favor of accountability – provided it is done properly. I am all in favor of standardization – provided it is done properly. Those provisos are important! The current reliance on high-stakes multiple-guess tests is not the right approach. Not even close. Recommendation: Step #1: We simply must stop over-emphasizing high-stakes “standardized” multiple-guess tests. I’m not sure we need to do away with all such tests immediately, but the over-reliance needs to end, immediately and entirely. It is simply outrageous that we would judge students, teachers, and/or schools based on such horrible tests. For more on this, see reference 2. Recommendation Step #2: We need to establish proper systems for assessment, accountability, and standardization. We need to take step #1 immediately. Step #2 will take some time and effort. We can begin step #2 in parallel with step #1, but we need to take step #1 immediately, without waiting for completion of step #2. The assessment, accountability, and standardization we have now is worse than nothing, so there is no downside to step #1. Beware that in some cases (e.g. problem 5) the answer in the back of the book is not correct. Surely You’re Joking, Mr. Feynman. (search for “in regard to education”). Associated Press (20 July 2008). Current Science, Teacher’s Edition (1964). The infamous “density triangle” and “Ohm’s law triangle” were invented to serve as crutches for people who have no clue about algebra. If you’ve never heard of these things, that’s good. Don’t worry about it. See reference 8 for ways to make long division and long multiplication more efficient.